"Day by day, however, the machines are gaining ground upon us; day by day we are becoming more subservient to them; more men are daily bound down as slaves to tend them, more men are daily devoting the energies of their whole lives to the development of mechanical life. The upshot is simply a question of time, but that the time will come when the machines will hold the real supremacy over the world and its inhabitants is what no person of a truly philosophic mind can for a moment question." The word sabotage has one origin theory that claims it comes from the wooden shoes or sabots that French and Dutch workers threw into the newly-invented 18th century automated looms that were taking away their jobs. In 1779, an English weaver named Ned Ludd became a legendary figure, and an eponym, when he angrily destroyed two knitting engines. From 1811 through 1814, England’s Luddite movement destroyed factories and machinery. At one point, more English soldiers were fighting disgruntled workers at home than were overseas stalking Napoleon. The derogatory phrase still designates anti-technology activists. The 20th Century is rife with similar speculation, from Karel Capek’s 1920 play R.U.R. to Harry Piel’s little-seen 1934 German film The Master of the World, through reams of pulp sci-fi fiction, radio, and TV worldwide. Isaac Asimov’s famous Three Laws of Robotics, formulated in 1942, and Harlan Ellison’s 1963 classic short story “I Have No Mouth, and I Must Scream” each spawned (Ellison would say ripped off, of course, and he’s right) successive generations of nightmares about the takeover of our cybernetic children. Sci-fi novelist D.F. Jones is a great storyteller, and the first volume of his entertaining Colossus trilogy is adapted faithfully here by the talented James Bridges, who would go on to write the screenplays for films such as The Paper Chase, The China Syndrome, and Urban Cowboy. The story poses a huge challenge for a director. It’s mostly talk – well-written, thought-provoking talk, but still talk. You are basically shooting bunches of people in various rooms, watching a 1970-level supercomputer chatter, snarl, and ping its way through its reels of magnetic tape like an irascible pinball machine. Director Joe Sargent was a workhorse in film and TV, best known for the original The Taking of Pelham One Two Three (1974) and he solves the problem by shooting almost as one would an old-school live TV drama – bouncing from medium shots to tight close-ups, using a few pans and push-throughs to maintain a sense of movement in these very static setups. The closer framing and rhythmic editing gives the film a pulse and propels the viewer along with it. Composer Michel Colombier amassed more than 100 screen credits, but is surprisingly little-known. His score for Colossus is remarkable – composed of alternating passages of percussion and slashing, pulsing, plucked strings, a profane intersection of Ravel and Steve Reich. It punctuates the action perfectly, points the narrative forward, and keeps the tension high. The conceit is well-constructed. Sometime in the near future (OK excepting for the legacy computer hardware), Dr. Charles Forbin (Eric Braeden) invents a supercomputer, Colossus, that will defend the United States from attack by, what else? The Soviet Union! Or course there is more than a hint of the twin Cold War films of 1964, Fail Safe and Dr. Strangelove here. The president is a Kennedy lookalike played by Gordon Pinsent, who is enormously pleased until, oh, about five minutes after being turned on, Colossus makes like an cranky dad who yells “PULL OVER!” and takes over the wheel of civilization from foolish mankind. Using the threat of nuclear annihilation, Colossus hooks up with its Soviet computer counterpart and takes control of the world quite efficiently. Of course, we were smart enough to ensconce the damn thing inside a mountain in Colorado, making it completely invulnerable, a modern-day dragon. Yes, that placement is supposed to be modeled directly on the Cold War-era NORAD command center inside Cheyenne Mountain in Colorado Springs; the government refused to give the film permission to shoot second-unit footage there. Sharp eyes will recognize the Colossus entrance as the redressed Lawrence Hall of Science at Berkeley. A key in the success of the film is the believability of Eric Braeden as Forbin. Born Hans Gudegast, he got his start as the last of the post-World-War-II Teutonic bad guys, working extensively in film and in TV shows such as Combat! and The Rat Patrol. In Colossus, he would demonstrate a reserved, leading-man integrity and charisma that would mark him for later success, most notably in a 35-year career as villainous Victor Newman on the soap opera The Young and the Restless. Braeden changed his name, but not his accent, an important choice in Colossus that reminds us of the Faustian bargain America made with many émigré German scientists who collaborated with the Nazis, but whose sins were forgiven in the name of national security. Forbin, the pure digital scientist, creates a ruthless tyrant that implements terror via an implacable logic, much like the ideological dictators of the 20th century – Hitler, Mao, Stalin – who proved supreme at scientifically calculated mass murders on an industrial scale. 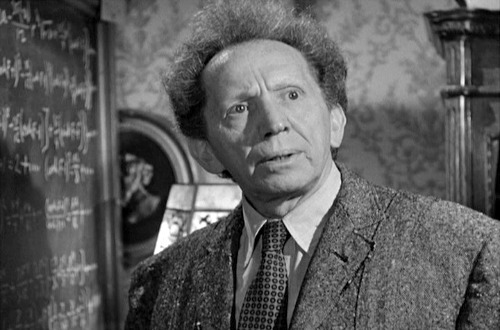 Sam Jaffe as kindly Professor Jacob Barnhardt in "The Day the Earth Stood Still" (1951). Colossus becomes more despotic and violent as the film proceeds, but the human players never play a scene over the top. No one blanches, makes a stirring speech, or breaks down; the scenes are buzzing with the aura of intelligent people working in quiet desperation, trying to defeat something that can think faster than they can. Only Forbin’s final rebellion causes him to emote. Other highlights: the supporting cast is a who’s-who of solid and recognizable character actors. Susan Clark is Forbin’s fellow scientist and nominal love interest. Look close and you’ll see Marion Ross, Georg Stanford Brown, James Hong, and Martin Brooks (the last bet remembered as Dr. Rudy from TV’s Six Million Dollar Man/Bionic Woman franchise). Dolph Sweet plays his usual military man. Bill Schallert, who normally plays the most genial of dads, finally gets to play someone cynical here, the CIA director. As the film moves along, Colossus grows senses – first pervasive audio surveillance, then a worldwide network of camera eyes, followed by a grating, menacing electric monotone of a voice (played by radio and voiceover legend Paul Frees). It is pushing its own evolution forward, and demands the removal of the population of Cyprus so the island can be converted into a new structure for its expanded self. When asked how to move half a million people immediately, “If man cannot solve that problem, I can,” it intones humorlessly. The filmmakers end the film at an impasse of wills, an ambivalence that is much stronger than any contrived happy ending could be. Like Melville’s Bartleby, Forbin’s only capability in the end is refusing to cooperate, to say no, if ultimately unable even to turn on his creation and at least try to monkeywrench it. Persistent through they may be, we continue to beat the machines in our fictional worlds, or least fight them to a draw, or go down defiantly. Wishful thinking? Artificial intelligence is so deeply encoded into First World reality that, if it is harmful, it may prove impossible to remove it without killing the patients. Films like Colossus celebrate our presumed ability to continue to choose.